Towable core plug type aerator. Includes transport wheels and a drawbar for use behind ATV's or riding mowers. Has a weight tray to hold up to 150 lbs. Weighs 94 lbs without additional weight. 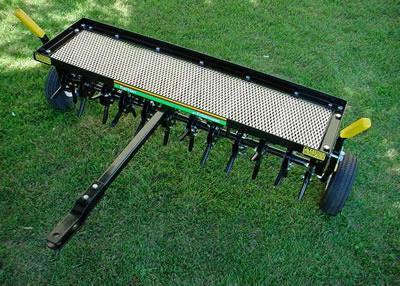 * Please call us with any questions about our aerator 32 inch towable rentals in Oak Grove MO, Blue Springs MO, Independence MO, Lexington MO, Odessa MO, Independence MO and Western Missouri.